Oh, you said you need an Indianapolis newborn photographer? I can help! I offer newborn photography services in Indianapolis and surrounding areas. But I do so much more than just take your photos. I’m a evocative storyteller who carefully documents your moment to make sure you can always go back to this feeling. I also photograph newborns in the hospital, during their first 48 hours of life. And I offer maternity photography, both in the studio for a more intimate feel, as well as outdoor on location for natural light photos. Imagine holding your new baby close, while the love of of your life wraps his arms around you SO tight. Wouldn’t that make your heart just explode? My sessions are about authentic moments like that!! Because I don’t want to just take your photo. I want to give you one of those rare moments to simply appreciate your life. The resulting photos will take your breath away. I preserve your memories in a nostalgic way, with film-style editing, and an emphasis on photo albums and bespoke wall art (that you can’t buy anywhere else). I also design bespoke birth announcement cards to your specifications. 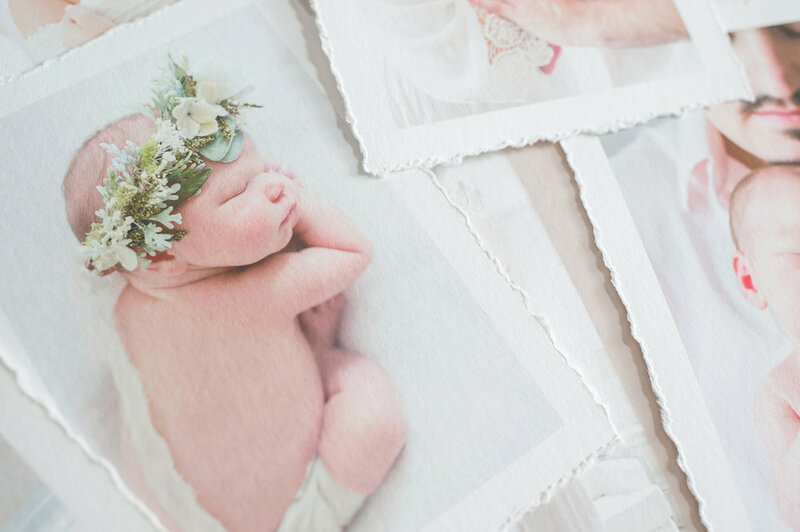 Your card will NOT be a mass produced Etsy template; it will as unique as your baby, and printed on a thick heirloom mounting for preservation. this includes a FREE 1st BIRTHDAY SESSION RESERVATION, my gift to you! saves space around your due date, and covers time in the studio. 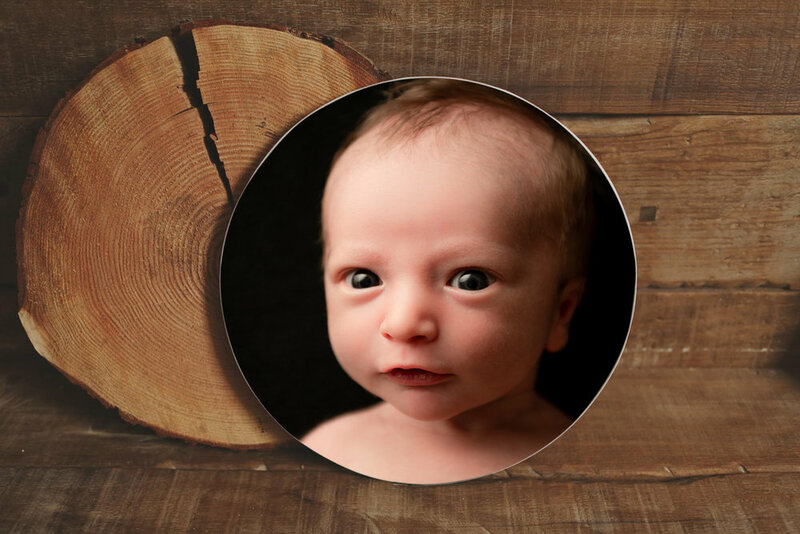 Parents and siblings can be in the photos with your newborn, and all props/accessories are provided for baby. Digital images are **NOT** included with your $250 reservation, they are an additional purchase made at my studio when you return to view the images from your session. wanting to chatting on the phone! Hey momma! I am SO excited to get to know you better and start planning out session. I will reply to your note as soon as possible Monday through Friday. Please allow up to 3 business days for a response (sometimes I have a baby boom). ready to book? tap here to get started! If you’re look for something special to celebrate the birth of your baby, this is it! Your memories are worth it!! Let’s chat today! Call 317-922-2211 or message below. We’ll start out with a chat — you can email me, schedule a phone consult, or come take a peek in the studio and meet up over donuts (one of life’s essentials) and coffee (the other essential). We’ll meet again at our session, where everything is easygoing and authentic. I will photograph your family with meaning, and carefully document the things that matter oh so much to you. A few days after your session, you’ll return to the studio for your image reveal. We’re talking tear-inducing slideshow on the big screen. 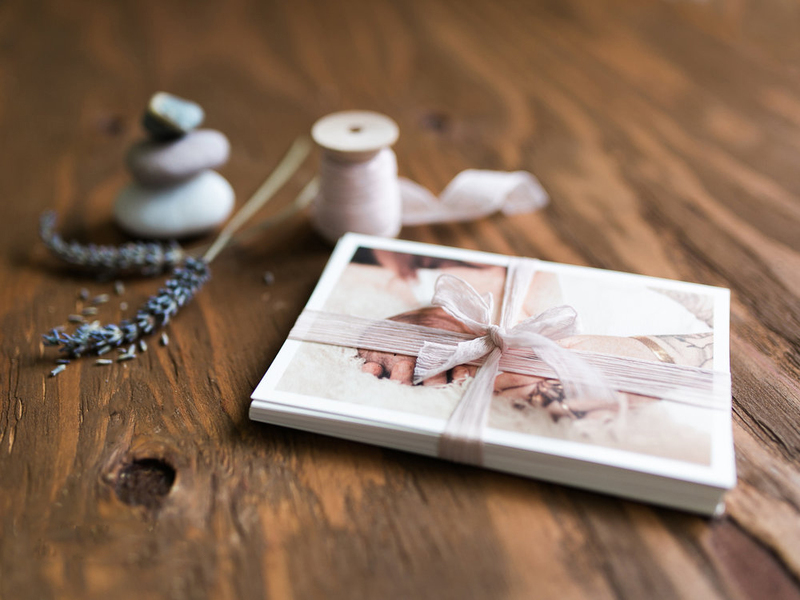 Together, we’ll create a customized package (a mix of digitals and bespoke prints) that is perfect for you. NOTE: You can’t walk away from me with just ephemeral digital images, to get lost on facebook or deleted from hard drives. Nope. I believe in giving you printed products that are expertly designed from my heart, to spark the joy in yours. Once your order is ready, you’ll stop by the studio to pick everything up. This can be tear jerking, once again. At this point we’ll probably be BFFs for life. And you’ll already be asking how soon you can come back for more! I’m not the photographer for you in you like to keep things quick and surface level. I won’t take many pictures of everyone looking at the camera. If kids cry, I’ll keep taking pictures. I will make you kiss your hubby. We will see a lot of each other. You might cry in front of me. From joy — or crazy pregnancy hormones. And that’s what will make the images so powerful and edifying to you. Yes, I want this experience for my newborn session!! I know a lot of moms are intimidated at the thought of having a photographer in the hospital right after giving birth — cuz childbirth is one WILD ride. But I absolutely promise it’s 100% something you won’t regret. Here are my 10 reasons why I love FRESH 48 photography. You only get to meet your baby once. I hear parents at newborn sessions talking about how they didn't get a picture of this or that at the hospital; you can never go back. In between the exhaustion and the craziness, there's something so beautiful and primal. Babies look like little grownups by the time they come in for newborn pictures a week or two after they're born, this is the only TRUE newborn time there is. It sets my inner photojournalist free for a little while. I can tell the story as I see it. Love is a mysterious, glorious thing. Through photos, we understand life better. $100 is due at booking to ensure space on my schedule. Images are purchased after the session. For image pricing, please message me. Ashlee is available to photograph brand new babies who are born at Community Hospital North, Community Hospital South, St Vincent Carmel, Hendricks Regional Health Hospital, IU Hospitals, and more. The difference in pricing between photographers can be huge — and shocking. It’s common to see it questioned all over the internet. Photographers have been trying to explain pricing for a while now. To be honest, I usually gag when they do. The whole “well, I have to pay rent, buy groceries, pay taxes, buy props, spend time answering emails and driving back and forth to the shoot” spiel isn’t at all helpful. What difference does it make to you, the customer, how many miles your photographer has to drive to the studio or how many hours they spend answering emails? Obviously when a business moves into the professional realm, there will be more cost involved than a photographer who’s taking pictures in their back yard. But that still doesn’t explain why one photographer can charge 10x as much as another. In the end, it’s actually pretty simple. You can pay to have someone hold a camera and push a button for you. That’s “affordable.” It’s low cost because it’s something anyone can do, including your grandma. Having expensive equipment or website fees doesn’t change anything about a person holding a camera and pushing a button. An artist can open your mind and heart to things you wouldn’t have ever experienced on your own. That’s a priceless gift. It’s like the difference between having a stuffed Mickey Mouse toy, and getting to see the REAL Mickey Mouse at Disney World. There’s just no comparison. If it means a lot to you to live to the fullest, to explore your existence, to know yourself better, then working with a photographer who has mastered the artistry of the medium is worth it. Whatever cost they charge is absolutely worth it — even if it’s thousands of dollars, that’s truly a very SMALL price to pay when you consider what you get in return. Again it’s like a trip to Disney. Does the price even come close to the value of seeing your kids swept up in the magical experience of a lifetime? I’m pretty sure parents everywhere would willingly pay 2 or 3 times more to give their child that meaningful of an experience. So there you have it. That’s the “secret” to why price varies from photographer to photographer. The ones who charge more do so because they can provide you with so much more than just photos. There’s no right or wrong decision when it comes to choosing a photographer to hire. There’s just the best decision for you and your needs. 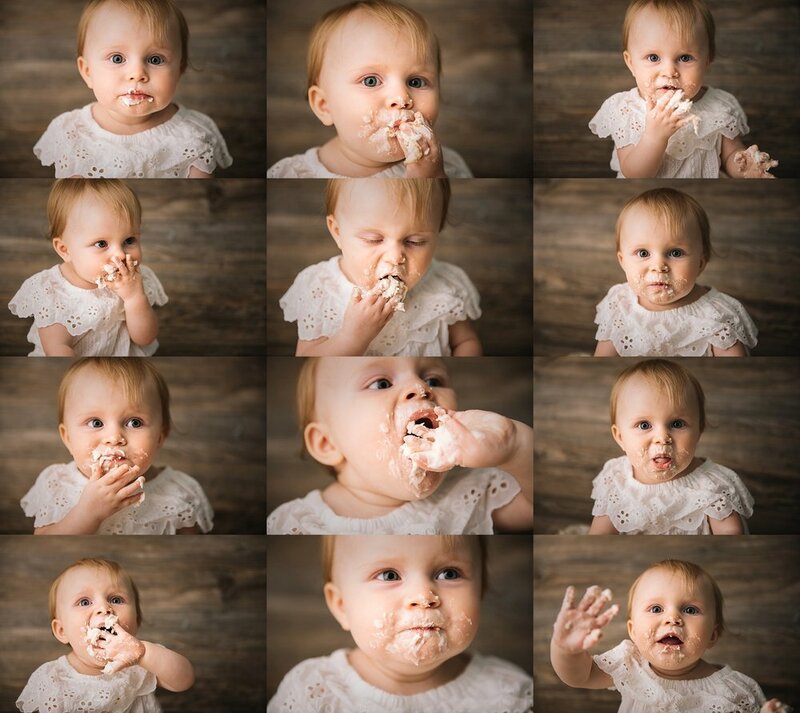 What’s the best type of smash cake for baby’s first birthday photos? Whether baby is a picky eater or is obsessed with food, a whole smash cake to themselves is going to be something they’ve NEVER experienced before. It’s important to not assume that cake being sweet equals being irresistible. I’ve had many babies in the studio who hated the icing, or the cake itself, or the whole thing. I’ve even had babies who would gag if the cake simply touched their lips, bless them. So how can you make sure that you have the best chance for hit smash? After doing lots and lots of first birthday sessions over the years, here’s what I’ve found is the best type of smash cake. Not only is a light crumb coat of icing fashionable and perfect for a farmhouse, shabby-chic look, it also keeps baby from getting overwhelmed too early. Thick icing tends to lead to a big sugar crash in just a few bites. I’ve also had a lot of babies FULLY melt down once their hands get sticky with icing. Not ideal for a cake smash shoot! Dye can taste really bitter, especially to babies who are still exploring the world of adult food. You might not ever notice it in cake, your little 1 year old is much more sensitive to tastes right now. My advice is to just not risk colored icing. Stick to white to be sure the flavor is as as simple as possible. I know that sounds kinda funny, but I’ve had lots of little ones who hated being messy. A cute spoon is a great way around this. I recommend having one on hand at the session, just in case. Remember, this isn’t really about the cake. This is about celebrating your baby turning 1 year old, and all the delightful aspects of their new toddler personality. If baby ends up hating the cake no mater how careful you are, just let go an enjoy it. This is who your baby really is. And I think think that’s beautiful — plus those crying over cake pictures are ultimately pretty funny! Glad you asked! I also photograph . . .
AND if you’re a newborn client, you’re in my exclusive BABY CLUB! That means you can book additional baby sessions between newborn and 12 months old for special prices. Looking for Indianapolis NEWBORN photographers? You found a great one! 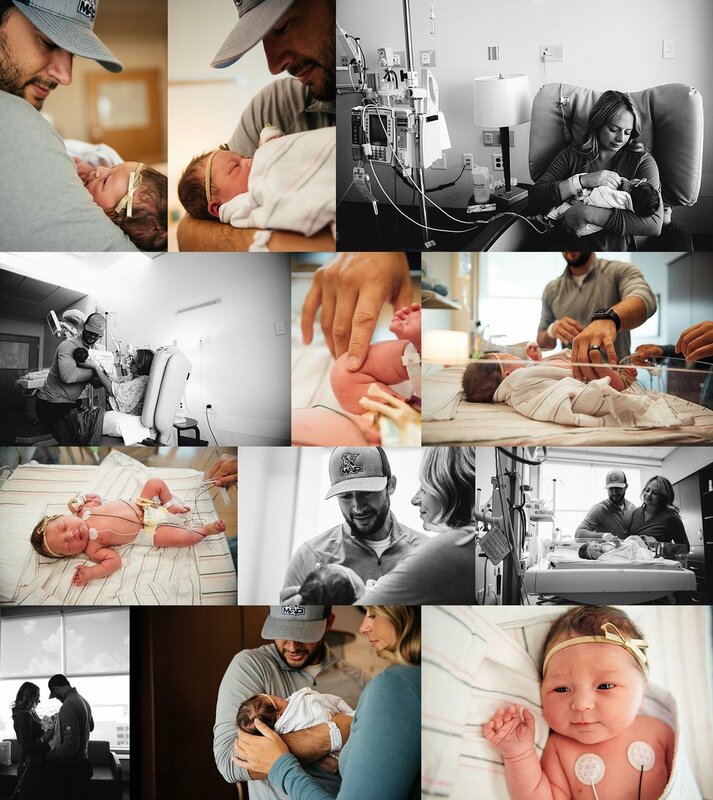 Ashlee loves photographing newborns authentically and making everything easy for new parents. Check out some of her recent work on the blog. I need an Indianapolis newborn photographer! what's it REALLY like to have a baby? Indy moms share their stories!